Birch bolete bisque. These words have been rolling around in my head a long, long time, and when I finally made the dish that I’d been thinking of, it did not disappoint. 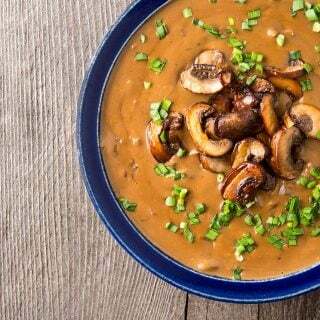 Don’t get me wrong, you can make a mushroom bisque with any mushroom — indeed, the garnish on mine were simple cremini mushrooms from the supermarket. But birch boletes just kinda lend themselves to soup. And I’ll admit I like the alliteration. What is a bisque? Technically it’s a creamy seafood soup from France, but the term has morphed to mean any creamy soup. Think of this recipe as one for real-deal, homemade cream of mushroom soup. 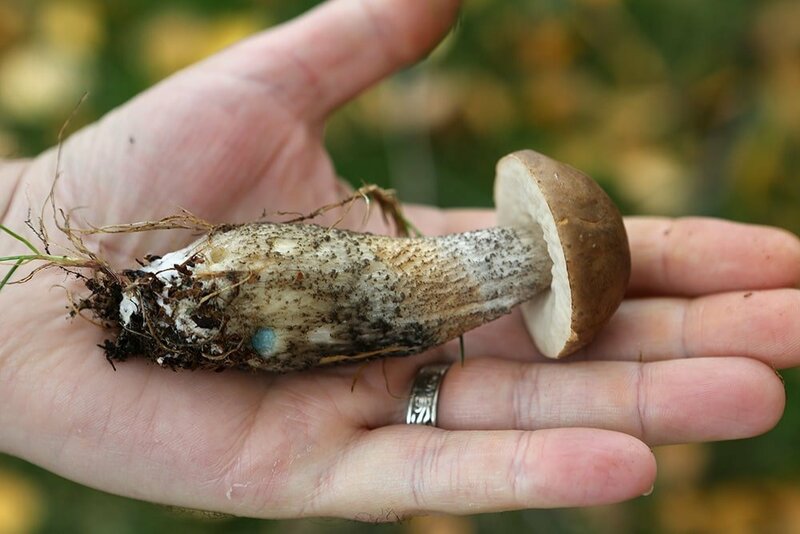 What is a birch bolete? Well, it is a cousin of the King of All Mushrooms, the porcino, a/k/a cepe, penny bun or steinpilz. These ‘shrooms tend to be smaller, however, and, as you might expect, like to live around birches. We have no real birch forests here in NorCal, but they are often used as landscaping plants. Look for them here in late November and December. 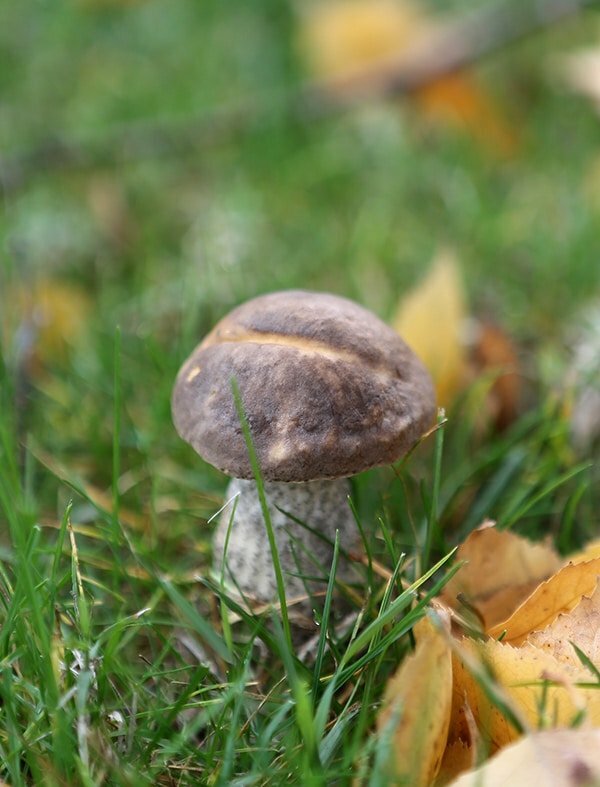 Technically they are a leccinum, L. scabrum to be exact… ish. You see, there are lots of different kinds of these. Most have red or orange tops. Birch boletes don’t. They’re pretty gray-brown all over. And so far as I can tell, have never made anyone sick — the same can’t be said for the orange-topped aspen bolete in Colorado. Anyway, don’t get all hung up on birch boletes. Like I said, any mushroom will do. 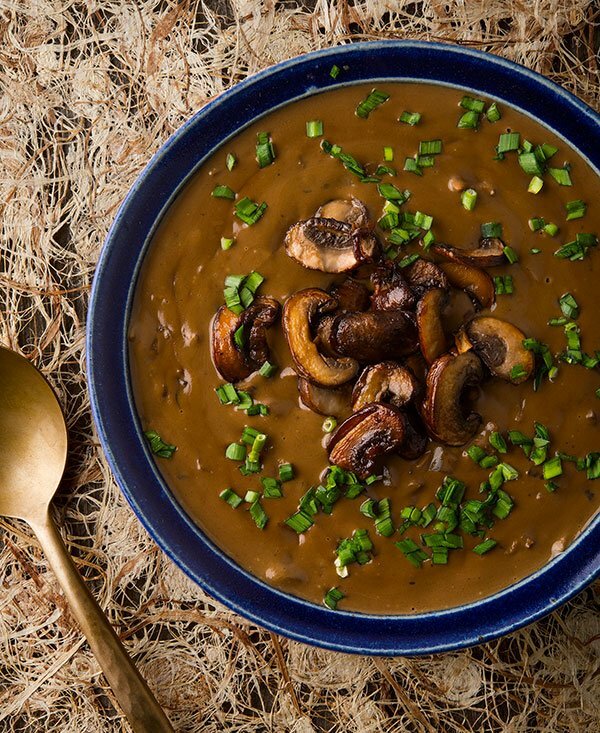 The secret to this recipe is to use both dried and fresh mushrooms, and to use the soaking water as the broth. Sure, you can use chicken broth, but it won’t be quite so mushroomy then. Another key is to blend only part of the soup, so it will be smooth and creamy, but still with some texture. I find that if I blend the whole thing, everyone thinks I am serving them a bowl of gravy… not that there’s anything wrong with eating a bowl of gravy. 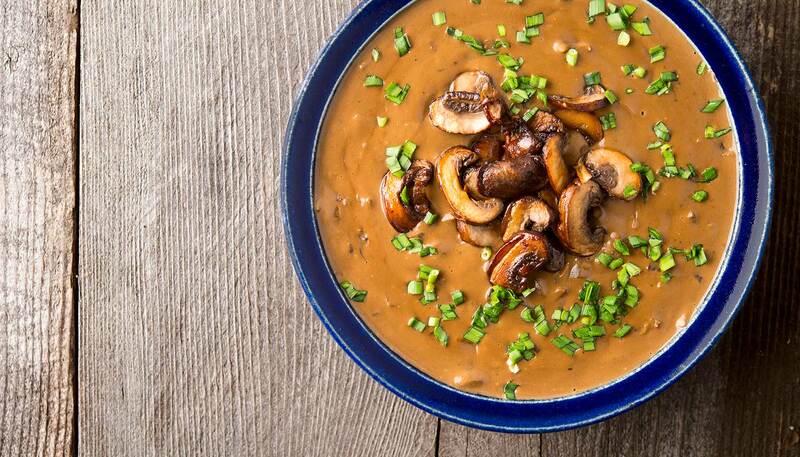 Note that unlike many mushroom bisque recipes, I use no flour to thicken the soup — the mushrooms themselves do that — and I only use a little cream. Feel free to use more if you’d like, but I find that too much cream makes the soup impossibly rich. While I relied on wild birch boletes and store-bought cremini mushrooms here, you can really use any mushroom you'd like. Each one will make the bisque a bit different, and you will ultimately come up with your own blend that suits your taste, your time, and your place. Whatever green garnish you choose, please use something. I find that the bisque gets disturbingly like gravy if you don't have something bright and green in it. And while yes, this is vegetarian, feel free to use chicken or beer or wild game broths in its place. Break the dried mushrooms up and soak them in the hot water for 45 minutes to an hour. Chop fine once they're soft. Save the soaking water and strain it through a paper towel to remove debris and dirt. Heat 3 tablespoons of butter in a soup pot and cook the onions and mushrooms over medium heat, stirring occasionally, until they start to brown, about 10 minutes. Add the reconstituted mushrooms to the pot, stir well and cook another minute or three. Add the sherry, a healthy dash of salt and the thyme. Stir well and scrape off any browned bits from the bottom of the pot. Add 4 cups of the soaking water and bring to a simmer. Cook gently for 20 t0 30 minutes. Meanwhile, slice the garnish mushrooms and saute in the remaining tablespoon of butter until nicely browned. Set aside. Ladle about 1/3 to 1/2 of the soup into a blender and puree. Chances are it will seize up and be too thick, so add the remaining soaking water to loosen things up. Return this to the pot, stir well and add some water if you think it's too thick. Return to a simmer. To serve, stir in some heavy cream and lots of black pepper. Ladle into bowls and garnish with the sauteed mushrooms and herbs. Once made, this bisque will keep in the fridge a week. It doesn't freeze very well once it has the cream in it, so if you make a big batch to freeze, skip the cream until you plan to eat it. The Kings are quite distinguishable from the birch boletes in S.E. Alaska. The Kings get quite huge and are much bigger around. But I love them both. I love the mushrooms in my little four acres in my rain forest woods. I am going to try the Fly Agaric possibly this fall as my path to my home is lined with them. But I will be very cautious to leach out the toxins. Thanks so much for posting your enlightening information on them. I’m trying this bisque dairy-free ’cause I’m allergic to dairy. Substitutions: plain veg oil for butter (I’d use duck or goose fat if I had it), 1/2 rice milk for cream, plus 50% extra alliums (onion/leek mix; cooked-apart leeks have a viscid texture). I serve a creme fraiche at the table for the rest of the family. Coming from my Czech tradition, I struggle not to load this soup with caraway seed (although my German friend would use cumin seed instead). I’ll add a squeeze of lemon to bring the flavors out (chef Joel Robuchon’s trick). Also, if you can’t have dairy (or for a change of pace), soups such as these finish nicely with an artsy drizzle of balsamic vinegar reduction. BTW those 4oz of Boletus edulis are a king’s ransom worth of mushrooms if you have to buy them, the volume comes up to almost 4 cups (they sell for $6/0.5oz here in Pittsburgh). We are so lucky with our finds this year. Thank you for a great base recipe to play with, and happy mushrooming!